By Ashutosh KS in Desktop. Updated on March 22, 2018 . While Wine has been available since a long time, but its new-year release brought an important update — support for Android. That means, now you can easily run Windows apps on Android. And through this post, I will tell you just how to do that. Let’s take a look. Wine for Android is a simple app, and you only require an Android device with a working Internet connection to download and run it. 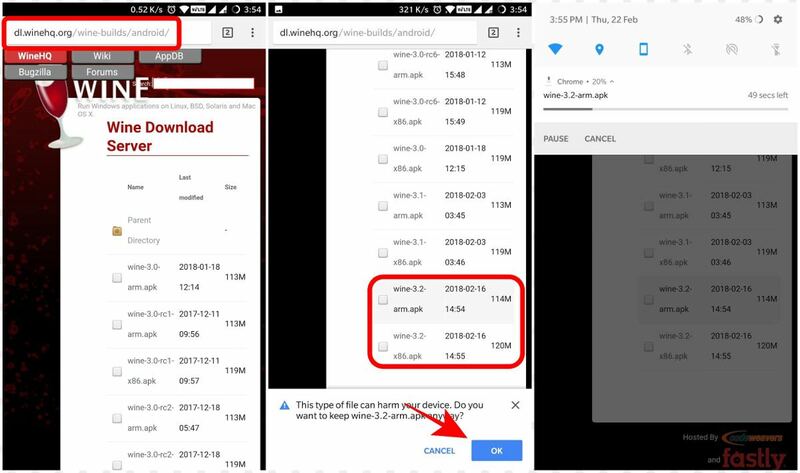 You can also download the required app (Wine’s APK) and Windows apps (.exe’s) on your computer and transfer them to your mobile device in case your smartphone does not have a working network connection. Open “https://dl.winehq.org/wine-builds/android/” in your mobile. Download the latest available release per your device platform. 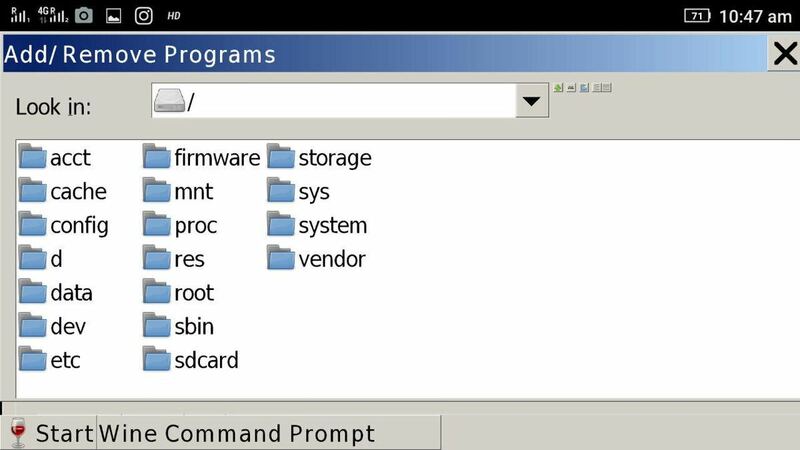 For instance, I downloaded “wine-3.2-arm.apk” on my phone, but you may need its “x86” version if your device has an Intel CPU in place of an ARM CPU (as mine). Open the downloaded APK, and install Wine app on your device. Open the Wine app on your Android device. If you are starting it for the first time, it will take some time to extract its files and set up the Windows environment, but from the second time onwards, it will be much faster. Once Wine is loaded, you will see a classic desktop of Windows, which instantly reminds me of Windows 98. You may click the Start button, and to your surprise, you will see just two options there, suggesting there is a lot more to do. Though Wine for Android has been made possible after making six thousand changes to its codebase yet it is still in its early stage. That said, at the time of writing, Wine 3.x supports only WinRT apps on ARM devices and Win32 apps on x86 devices, unfortunately. As most of us own a device powered by an ARM CPU, we can only run WinRT apps using Wine on Android. The list of supported WinRT apps is small, as you must have guessed by now; and you can access the complete app list on this thread on XDA Developers. However, if you are fortunate enough to hold a device with an Intel CPU like ASUS ZenFone 2, you have a lot more choices to pick from the supported apps. That is because you can run Win32 apps, i.e., x86 aka 32-bit apps using Wine for Android. On Wine’s desktop, click on the Start button. Choose Control Panel and go to “Add/Remove Programs” from the options. A new window will open. Click the Install button in it. A file dialog will open. Here you can browse and select the app (.exe) you wish to install. You will see the program’s installer. Follow the on-screen instructions provided by the installer and install the app as you install any other program in Windows. 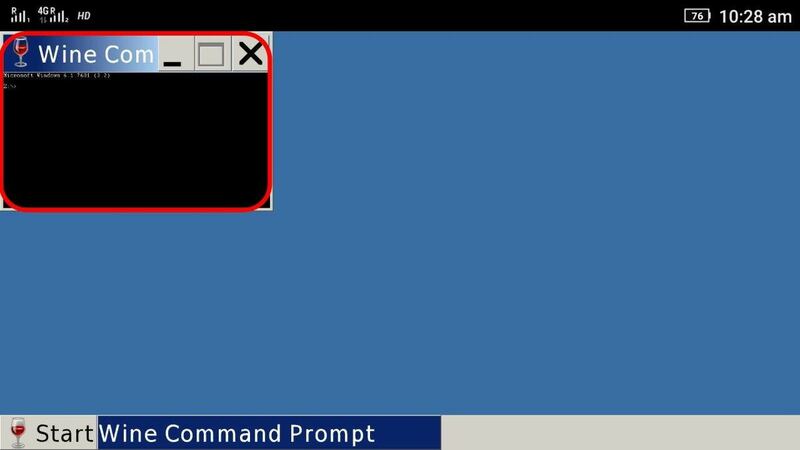 Alternatively, you can use Wine Command Prompt to install or run a program inside Wine. Just type the full path of the executable in the command prompt, and Wine will show the program’s installer. Afterward, simply follow the on-screen instructions and at the end of the process, the program will be installed. And you will see its entry under Start menu. For example, if you are trying to install Notepad++ (with “npp.exe” as its file) and its installer is present in your device’s Downloads directory, which is located at “/sdcard/Downloads”. Then you must type “/sdcard/Downloads/npp.exe” inside the command prompt window. Following are some of the most common Wine issues and some instructions on how to troubleshoot them. 1. 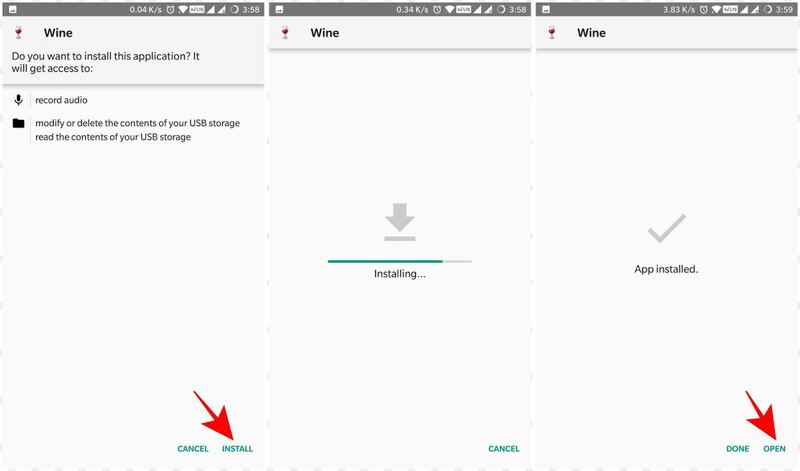 Wine won’t install on my Android device. If you can’t install it, maybe the downloaded APK file is corrupt. In this case, just download it fresh and try installing it again. While installing Wine, if you are getting a message saying “not allowed to install unknown apps“, then you need to change a setting. You can do it by heading over to Settings > Security and then toggling on “Unknown sources”. 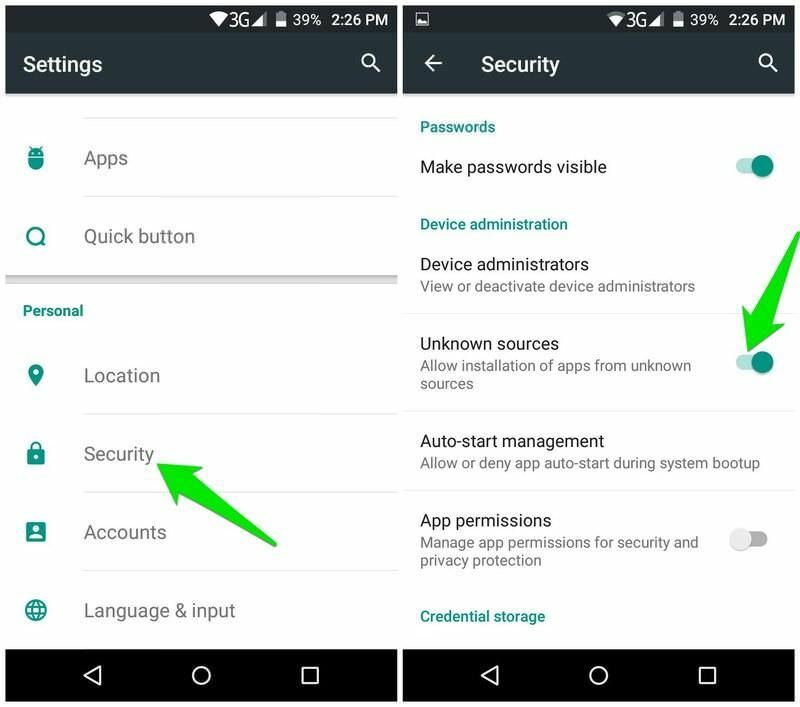 If you are not using Google’s flavor of Android, then this setting may reside at a different place — just search for it in Settings or google the procedure for your device. After you have changed this option, you can try installing this app — it shall work. 2. Wine won’t start/run on my Android device. If you are able to install Wine but not able to start or run the same, then there is some issue with your device — probably a compatibility problem. Also, please note that Wine 3.x (up to 3.2 at the time of writing) does not support Android 8 (Oreo) platform. That said, Wine 3.x on Android 8 will always get stuck on the “Setting up the Windows environment…” screen. 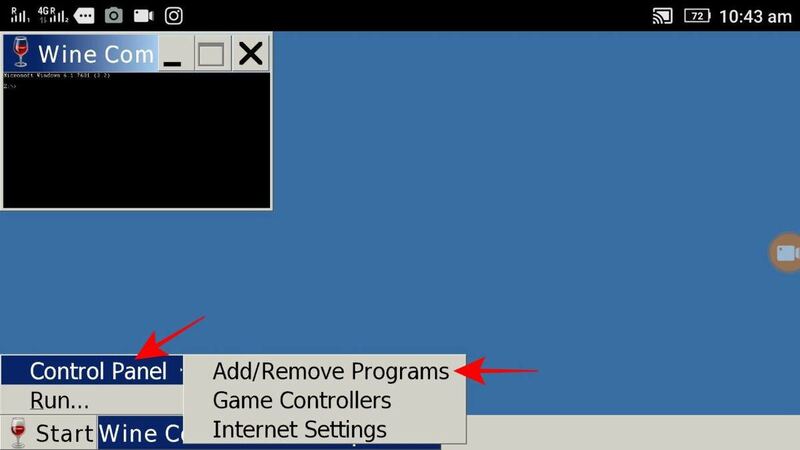 Moreover, during my tests using Android Emulator, I found that Wine 3.2 is not working on emulated devices — for both ARM and x86 versions. Though the devices are assigned enough resources yet I could not reach the classic desktop on Wine using an emulator. That being said, please know that Wine 3.2 may not work on AVD (Android Virtual Device). 3. Soft aka on-screen keyboard is not showing up. Wine 3.2 is not yet complete in terms of features and this bug is one of the proofs of its imperfection. That being said, you will need a physical keyboard (like Bluetooth keyboard) to work with Wine. It is because soft keyboard won’t show up on the screen in case you wish to type something, and the only workaround is to plug in a hard keyboard. 4. I cannot choose a directory or a file in the file dialog. Windows default setting needs you to double-click an item (say a file or folder) to open it, as you must have done in Windows. Since we are talking about touch-enabled devices, we need to double tap to emulate a double-click. And I found it does not work very well, at least for now. That’s why, it is good to use a physical keyboard and use its navigation keys to navigate through windows, options, directories, etc. or choose a file or folder. Hope you are successful at installing and running Windows apps on Android using Wine. If you get into problems, you can ask for a solution on WineHQ Forums, and you can also write a comment below to ask me directly.